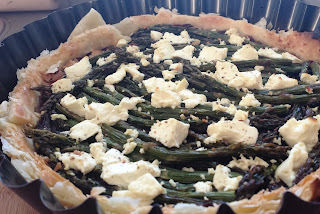 Been waiting for spring to arrive and now asparagus is in the stores just waiting to be made into yummy things like this tart which comes from The French Market cookbook with some changes, Alisa style. The pastry is easy to make as you can do it in a food processor, but if you don't have time substitute with 1 sheet ready-rolled puff pastry, like I've used in the first photo vs homemade pastry below. You can also buy caramelized onions but they are really easy to make if you have 30 minutes. In a food processor add all the above ingredients and mix together in short pulses until the dough starts to come together. Turn out onto a clean surface and knead lightly until it forms a ball. Add a little flour or few drops of water to reach a workable consistency. Flatten it into a thick disk or square, to match the shape of the tart you plan to make. Wrap in gladwrap and refrigerate for 30 minutes or overnight. Return to just below room temperature before using. To make the onion jam, put the olive oil, onions and honey in a saucepan over a high heat and stir well for a couple of minutes. Turn down the heat and let the onion mixture simmer for around 30 minutes stirring occasionally until the onions are very soft and remove from heat to cool. Roll out the dough to fit the size of your tart tin. You can do this between two baking sheets if it gets too sticky. Gently spread the onion jam over pastry and arrange asparagus decoratively on top of onions. Crumble big chunks of feta over the top. 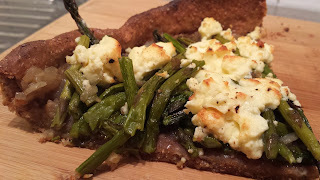 Bake until asparagus is roasted, feta has softened and crust is golden brown, about 30 minutes. Serve with strips of lemon zest and freshly ground black pepper over the top. Enjoy!